Q: When is 3 plus 4 not 7? A: When the 3 and the 4 are in different directions. Walk 3 miles due east, say, then 4 miles due north. You are not 7 miles from your starting point; you are 5 miles from your starting point. To be fair, telling someone to go “3 miles due east” isn’t the same as saying to go “3 miles.” It also includes the direction “due east.” The reason your final distance from the starting point is less than 7 miles is because you have a 90-degree angle between the two legs of your journey. On the other hand, were the two directions the same, then indeed you would be 7 miles from your starting point. A similar thing can happen in the decay of subatomic particles. In the process of calculating the rate of the decay, we compute a thing called the amplitude, which has both a distance and a direction to it. The distance and direction are in an abstract mathematical space rather than on the surface of the Earth, but otherwise it is similar. If there are two ways or paths in which the decay can happen, we add the two amplitudes and take into account the angle between them. For example, the Upsilon, Υ, can turn into a photon, which turns into a muon pair; that is one path. The Υ can also turn into a Z boson, which turns into a muon pair; that is another path. To add the two paths correctly, one has to allow for the angle between them in this abstract space. This effect is called interference. Some of the differences between matter and antimatter are due to this effect; the angle between two amplitudes for two paths in the decay of a particle and the corresponding angle for the antiparticle can be different. As a result the sum of the two paths for the particle and the antiparticle are different. 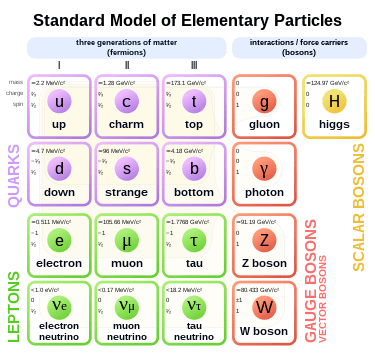 The particle containing a charm quark and a down antiquark is called a D+ meson. 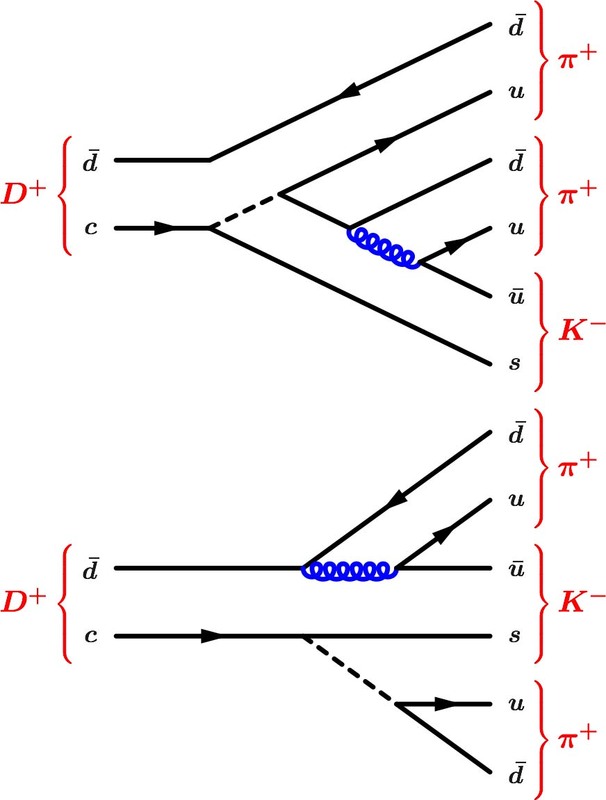 It can decay to a kaon, K-, and a pair of pions, π+, through several different paths; two are shown in the figure. In the Standard Model though, all the amplitudes have the same direction, and they add up directly — there is no interference. Accordingly, the expectation is that the D+ meson and its antiparticle, the D-, should decay at the same rate. On the other hand, if there is new physics involved, the amplitudes might be in different directions. Then there could be interference and there could be a difference between decays of the particle and the antiparticle. The DZero collaboration has measured the difference (called the asymmetry) between the rate of this decay for the D+ and the D-. The result is that the asymmetry is -0.17 ± 0.17 percent. In other words, the asymmetry is indeed zero, allowing for the uncertainty in the measurement. The previous measurement, by the CLEO experiment, had an uncertainty of ± 0.98 percent, and so the DZero result is almost six times more precise. Even with this improved measurement, the Standard Model prediction that 3 + 4 = 7 holds up.